This portfolio collection is a small sampling of the 100s of illustrations that were done for Toyota Motor Corporation brochures and national advertising campaigns during the late 1980s and 1990s. 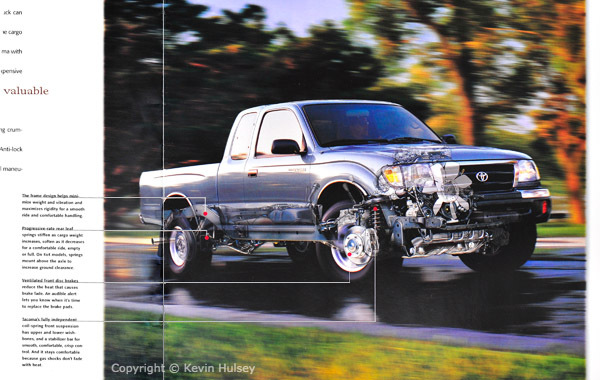 Illustrations were created for the following Toyota models: Avalon, Camry, Corolla and Solara sedans, Celica and Supra sports cars, Sienna minivans, and the 4Runner, Land Cruiser, Rav4, Tacoma and Tundra trucks and SUVs. This cutaway of the Supra was used in national ads for Road & Track and Automobile Magazine as well as consumer brochures and posters. 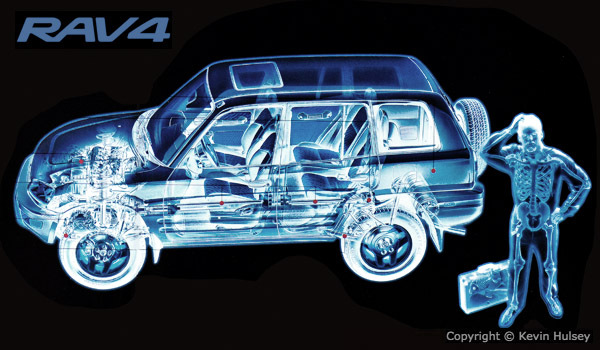 This x-ray illustration of a Rav4 was used in dealership posters nationwide as well as the consumer brochure. 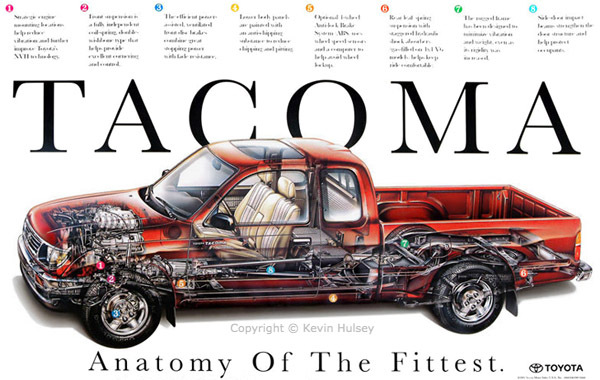 This above cutaway poster illustration of a Tacoma pickup truck was used in Toyota dealerships nationwide. 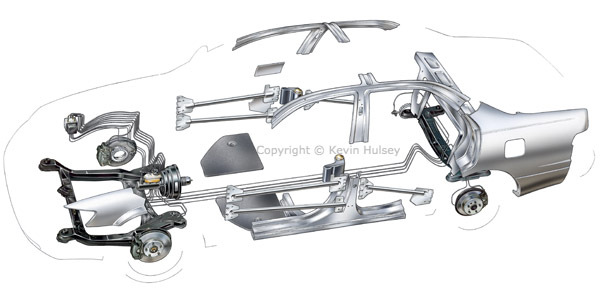 This next image was part of a series of overlay illustrations showing structural reinforcements and safety features such as door pillars, roof reinforcements, door beams, crumple zones and anti-lock brakes. 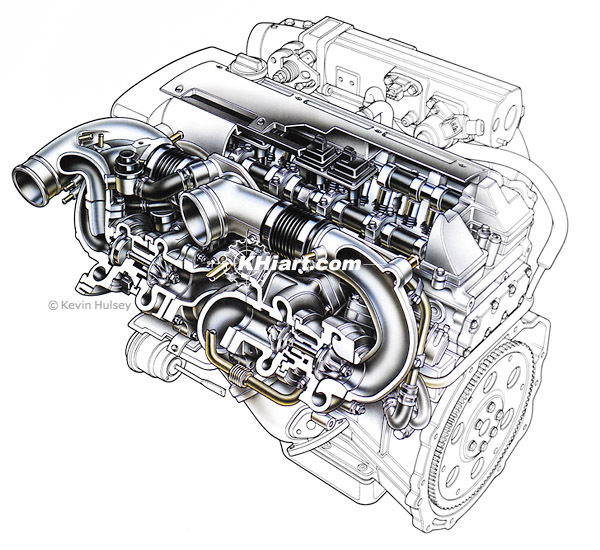 The above image was part of a series of overlay illustrations showing the engine, chassis, driveline and suspension. 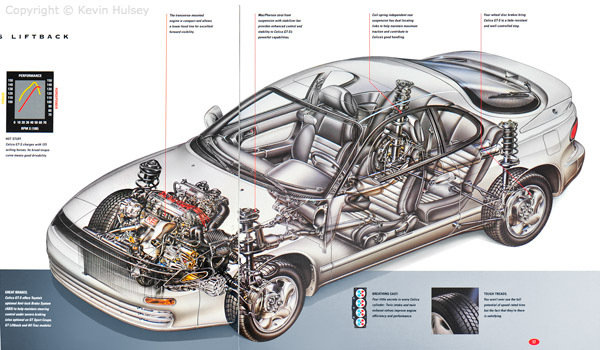 This Supra brochure cutaway image is of Toyota's 2,997cc 2JZ-GE I6 twin turbo charged engine. 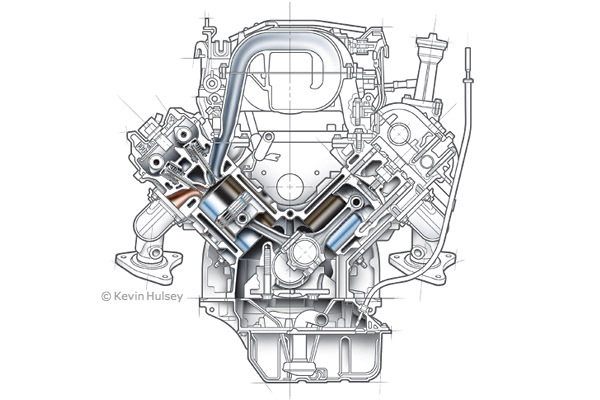 This overlay illustration shows the engine, chassis, driveline and suspension in a 4Runner SUV. 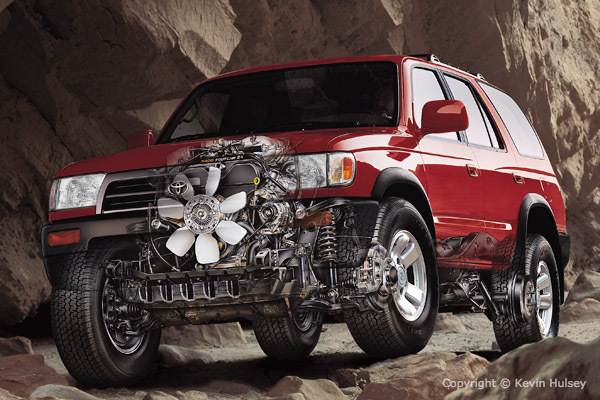 This cutaway image is of Toyota's Land Cruiser brochure, showing their V8 engine. 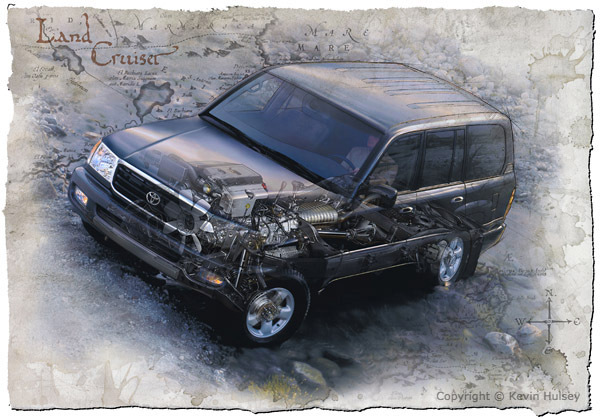 This overlay illustration on an antique map features a Toyota Land Cruiser with the engine, chassis, driveline and suspension showing through the outer body as the vehicle crosses a stream. The above cutaway is of a Celica ST Liftback. All Images Copyright © 1994-2017 khiart.com, all rights reserved.